Touristplacesinindia offers complete information on Tourism in Lucknow, Lucknow Travel, Lucknow Hotels, Lucknow Tourism, Hotels in Lucknow, Tours in Lucknow, Tour Packages for Lucknow. The city of Nawabs (regional aristrocrats), as Lucknow is often called, is today the capital of the largest state of India, Uttar Pradesh. The city has a glorious history and has been hailed as one of the centers of culture in Northern India. Even today, it is among the major highlights of Uttar Pradesh tourism, and the numerous tourist attractions in Lucknow indicate the high levels achieved by the engineers and architects of the time. The area around present day Lucknow has been part of numerous kingdoms ever since the first large states started to form in North India. After a shift of capital from Faizabad in 1775, the city came to prominence and became the hub of cultural activities in Awadh, a state that existed almost independently under the nominal suzerainty of the Mughul Emperor in the 18th century. Awadh was annexed by the British East India Company in 1856, and the last Nawab, Wajid Ali Shah was deposed. The next year saw the city become one of the centers of the Sepoy mutiny of 1857, or the first war of Indian independence, as many view it as. The gradual decline in the rich traditions was inevitable, but thankfully, Lucknow still preserves many of its rich traditions. The city has been the cradle of the Urdu language which has flourished here as nowhere else. Lucknow has produced famous poets and writers in Hindi and Urdu, including Khwaja Haidar Ali Atish, Musahafi, Amir Meenai, Daya Shankar Kaul Nasim and Meer Taqi Meer. The city has also been a major center of Shiite culture and a genre of poetry called marsia, based on Shiite religion, has developed here. The dignified manners of the city�s residents had reached legendary heights during the late 19th century. It is believed that a resident of Luknow can curse someone in such a way that the person targeted would feel that he is being praised. That culture is almost redundant today, having got fused by many other, chiefly western influences. Famous exponents of music and dance have blossomed here. Kathak, a classical dance form of India, has been patronized by the rulers here, and stalwarts like Birju Maharaj have taken the art to the highest level. Singers like Begum Akhtar belong to lucknow. The city witnessed a spur in building during the reign of the last Nawabs of Awadh. 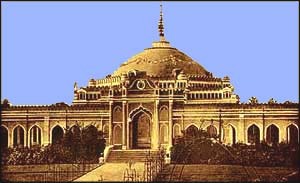 A large number of magnificent buildings were erected, many of which today form the core of tourism in Lucknow. Bara Imambara, Qaiser Bagh palace, Chattar manzil, and Daulat Khana are some of the best known buildings here. These buildings reflect the fusion of traditional Indian, Islamic, and later European elements, and are among the top tourist attractions in Lucknow. Lucknow is well known for the amazing variety of cuisine available here. The city�s inhabitants loved their food, and a rich culinary tradition has evolved over centuries to make up the local cuisine of today. Biriyani, kebabs, rumali roti, and a vast range of delicious sweets make the tourists crave for more in the numerous food joints of the city. Western fast food joints also have their presence in the city. The city is immensely important to Uttar Pradesh tourism. The government has made adequate arrangements to ensure the growth of tourism in Lucknow. The city offers a wide range of accommodation options, and is easily accessible form the major cities of India by air, rail or road transport. Touristplacesinindia.com offers all inclusive information on Lucknow, in India, and other tourist places in India.